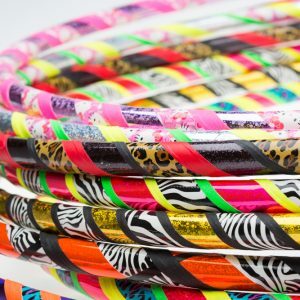 The Zebra Rave hula hoop is a techno jungle affair to bring out the WILD side. The sparkliest, craziest, longest lasting kids hula hoops on the planet! Created from quality, 100% Australian made durable, flexible plastic and pop-riveted for a longer lasting hoop. Which hula hoop is right for your child? All hula hoops have grip tape incorporated into their designs which helps keep them up. Once you have selected a hula hoop design that your kid will love, the next step is choosing the right size. What size hula hoop is best for my child?